snackTAXI is proudly made in America by local sewers in Massachusetts. It is an amazing creation for everyone that is trying to go green! I never realized until I became a mom how much waste we actually go through each day and we really do produce a lot!! Plastic baggies are one of the many items that we go through like crazy. The US alone adds 20 million plastic baggies to landfills every single day. snackTAXI has sandwich sacks and snack sacks that are machine washable, the materials are free of lead, phthalates and BPA and each reusable bag you use keeps as many as 1,000 plastic bags out of the waste stream. For adults and for kids they offer so many fun colorful patterns and designs. I received the Fruit Stand Sandwich-Sack, which is the perfect fit for a generous sandwich, bagel or wrap, or a hearty snack! snackTAXI generously sent me the matching Fruit Stand Snack-Sack for a GIVEAWAY!! The snack-sack neatly fits rice cakes, pretzels or corn chips, and is equally good for carrot or celery sticks! Dimensions: 6″ W x 4.5″ H.
Twice as nice napkins… love reusing! I also love the aprons! 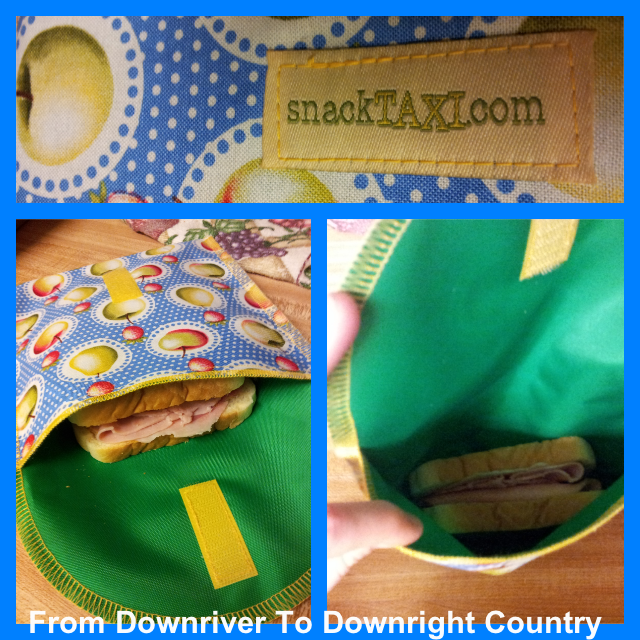 I love the sandwich and snack sacks, and I love the guitar print that’s shown….but I can’t actually find it listed anywhere! Love the idea of a produce bag! The lunch sacks and the produce sacks look very useful! I’d like the bread sack to keep my fresh baked bread in! I love the “good dogs” napkins! bread sacks would be great for my homemade bread. I like the anyday-apron daisy/honey vine. I want a produce sack! I’d like the produce sacks. Those snack bags are so great. I like their produce sacks. I like the bamboo sporks. I also like the produce bag. I like the delectable snack-sack. i like the produce and bread bags. I would also love to try their bread sacks….super handy.